When contractors for the U.S. Army Corps of Engineers begin building protective dunes along Ocean County’s northern barrier island in early 2015, their plans will include Point Pleasant Beach and Seaside Heights, home to two boardwalks and one privately owned ocean beach. The same process is currently underway in Seaside Heights, officials said. From Manasquan Inlet to Island Beach State Park, a dune and beach replenishment project is slated to begin in March or April of 2015, with bids going out in the next two weeks. In most areas, dunes will extent to about 23 feet in height, and the beaches themselves will be extended out a minimum of 200 feet. But in Point Pleasant Beach and Seaside Heights, there are piers that stretch out from two boardwalks that lure tourists with a view of the ocean. “By and large, there will be dunes in Point Pleasant Beach, and we’re trying to work with the structures that are there,” said Martin. 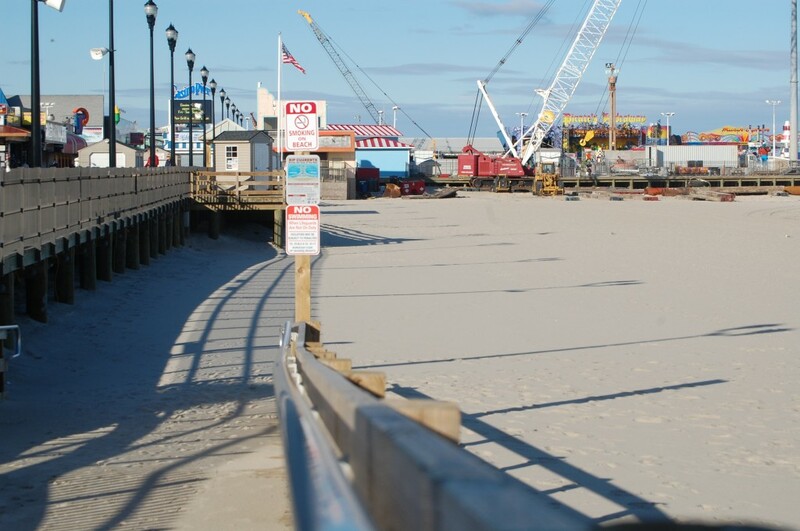 In both Point Pleasant Beach and Seaside Heights, engineering officials said the planned dunes will be about 18 feet above sea level, so depending on the grade of the beach in a certain area, a view of the ocean may eventually be something of the past for those walking the boards. “The project was designed to provide a level of protection independent of the view of the boardwalk,” said Bill Dixon, acting manager of the DEP’s Bureau of Coastal Engineering. In Seaside Heights, a dune 18 feet above sea level would equate to about three feet above the boardwalk, according to a study released by Rutgers University last year. In Point Pleasant Beach, officials said, the elevation changes from one end of the boardwalk to the other. Dixon compared the potential future view of the ocean from the two boardwalks to how the ocean is viewed from the Atlantic City bordwalk, where dunes are built east of the boards. In Point Pleasant Beach, most of the boardwalk is owned by the municipal government. A small portion of owned by Jenkinson’s, which also owns much of the beachfront itself. In Seaside Heights, the municipal government owns both the boardwalk and the beach, though Jenkinson’s operates Casino Pier. In Point Pleasant Beach, there is a pier owned by Martell’s Tiki Bar. Dunes will not be built in front of, under or behind either pier, said Eric Doyle, a DEP engineer. “Those piers actually absorb the wave energy similar to how a dune does, so the piers then become sacrificial, as with the dune,” Doyle said.